You can move a marker to another location when needed. In Timeline view, select a marker. Drag and drop the marker to the new location. NOTE Only one marker can be selected at a time; therefore, it is not possible to drag and drop multiple markers at the same time. 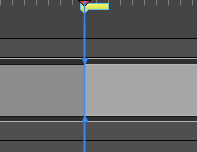 In the Timeline view, if more than one marker appears at the same time/frame, the last marker created or moved appears on top of the other(s). In Timeline view, right-click in the frame counter area and select Snapping. Drag the marker near the beginning of the new panel. When the marker snaps at the beginning of a new panel, a blue line with arrows will replace the red line of the red playhead.